Shinko tires or Golden Boy? Interesting that you would mention the 805's. In seeking a set of knob's for the 950 most of what I read (ADVrider) is the 805 rear and the 606 up front, specifically for DV area riding. I'll find out as I have a set of these sitting at the shop to be mounted. They'll be exercised in Death Valley in March. I'm sure they'll feel much better off road than the Pirelli MT90AT's, which have surprised me in dirt (both good & bad) with lowered pressure. That's really the only tire I've run on the 950, until now. I still have a TKC-80 on the front of my XR650L, with the D606 on the rear. (Actually, that's what's on the front of my KTM too.) The front seems to last a long time even if the rear can't seem to go 3000 miles. I wonder how a mix of Heidenau K60 Scout rear and TKC-80 front would work. The K60 front was worn out much quicker than the rear on my 990 Adv. I'm pretty sure I got about 8000 miles out of that rear even though it was majorly squared off by then. Still got good traction on the street. I've never gotten much more than 6000 miles on any tire before the K60. As I'm about to install the front tire I look for the directional arrows to make sure I don't put it on backwards and there aren't any. This is the first bi-directional tire I've seen in a long, long time. Now to see if I can install both without pinching a tube. Apparently I jinxed myself - I managed to pinch BOTH tubes. So I patched the front and finished the job. I tried patching the rear as well - took three patches - but one of the patches had the edge too close to a puncture and didn't hold. Put a new tube in that one. At least I'm able to get the tire back on the rim the SECOND time without pinching a tube - okay, technically the third time on that rear tire. Now I just need to put those wheels on my bike, shovel the snow off of my driveway, and I can see how they work on the street. But of course! Similar thing happened to me before. First tire went on easy peasy. Got cocky and rear tire saw 3 pinches before success. 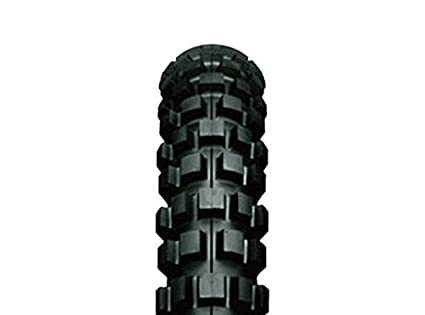 Try putting a little bit of air in the tubes when you are installing the tires to prevent pinching. I already know that trick and there was air in the tubes. I'm not sure what I did wrong, but the second time on each tire I didn't pinch anything. I know all of the theory for installing tires with tubes. I just manage to screw it up somehow when I'm actually doing it. It depends on the tire and wheel sometimes. I pinched the tubes on my supermoto wheel like 3 times. It could also be the condition of the tube also, I had this old crusty tube and it pinched super easy. I don't believe the condition of the tube theory. You have to squeeze the tube between the tire iron and the rim to pinch the thing, and I'll blame that 100% on technique. After pinching the new tube we were too lazy and impatient to patch it. We used up the two original tubes (one pinched and one installed) even though they were over 25 years old . Still holding air just fine. I've finally put some miles on the 244's. I like how they steer on dirt roads. Probably as good as any tire I've had on the bike. They seem just fine on the street, including miles of 85 mph running with no issues. I didn't bother trying to balance the tires and they seem just fine. I haven't tried getting serious lean angles on the tires yet, so I don't know how stable they'll feel. These tires don't seem to want to steer in silt, but I don't know what tire does. I've finally put some miles on the 244's. These tires don't seem to want to steer in silt but I don't know what tire does. 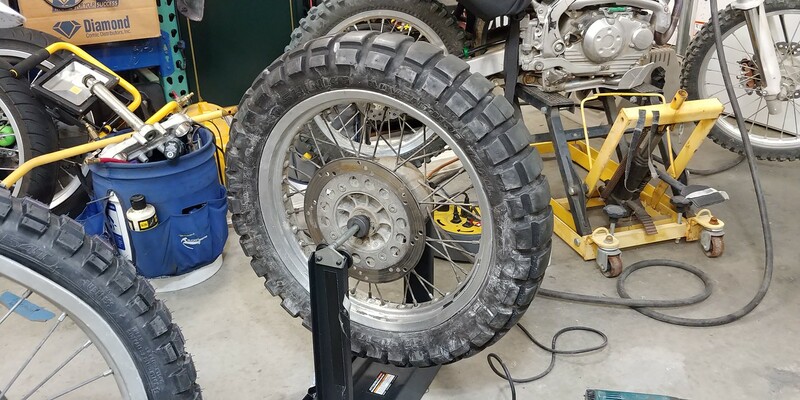 Most 50/50 dual-sport tires kinda underperform in silt, sand, soft conditions. The Golden Boy rear seems to do ok in the soft stuff but I think the front lacks enough open spaces between the knobs to get any bite. Upside being these closely spaced knobs perform much better on the street. 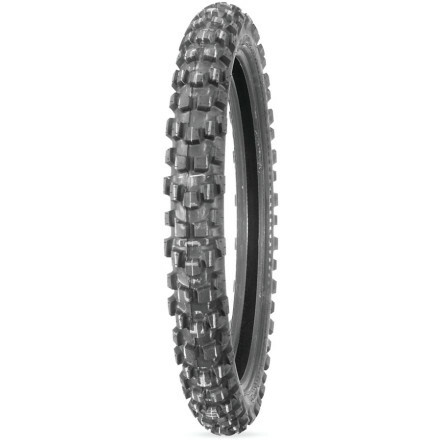 The next time you're planning a ride in soft dirt/sand keep the Golden Boy rear but try a slightly more knobby front, like the Dunlop D606, Pirelli MT21, IRC TR-8, etc. You should feel some improvement. Last edited by mototireguy; 03-23-2019 at 10:40 AM..
My dirt wheels have a D606 on the rear and a TKC-80 front. One of these days I'll swap the front for another D606. I rode with a guy a few months ago who has an XR600R and he likes the D606 front better than the MT21 for the conditions we have around here. It only takes me about 20 minutes to swap wheels, so it's easy enough to change to the right tires for the expected conditions.